We have just got back from working with Nursery and Reception children at St Thomas CE Primary School in Birmingham. 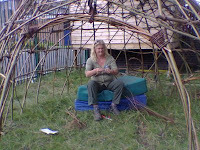 We made a nice willow den for the children to play i n and have circle time. 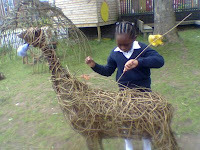 We also made a willow deer and some small willow items for the children to take home. The children were really excited to be working outside and we worked in small groups, regularly change d, to ensure that everyone had an interesting and enjoyable time. We will be at the CLA Game Fair at Belvoir Castle, Grantham and The RHS Flower Show at Tatton Park next weekend.